Note: Easily the most experience of the current top 3-year-olds with 10 starts at 2, he took 6 tries to break his maiden. His other two wins last year were in the Grand Canyon at Churchill and the Diamond Jo at Evangeline Downs. 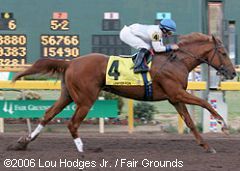 Started off 2006 with a decisive 8 1/4 length victory in the Risen Start Stakes at the Fair Grounds and followed up with a wire-to-wire win in the Southwest Stakes at Oaklawn. Proved he could rate and go a distance in the Rebel where he stayed th early then rallied to take the lead in the stretch and in by 3 lengths. Gave an impressive performance in his final prep, winning the Arkansas Derby where he took the lead after a half mile and then just drew away to win by 2 3/4 lengths. was never a factor in the Derby, finishing 12th. Came out of the race with an ankle injury.